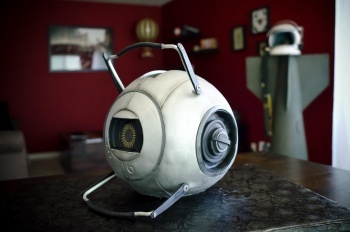 Mike's Amazing Cakes more than lives up to its name by crafting a phenomenal replica of Portal 2's Space Core entirely out of eggs, flour and sugar. First, a bit of backstory. Somewhere in Washington state there lives an adorable geek couple. To protect the names of the innocent, we shall refer to them as Mr. and Mrs. Sharkhats. Don't blame me. I just use the internet handles people give me. So, this couple fell in love and after a touching romance fit for a Kate Hudson romantic comedy, the duo decided to get hitched. As befits their geek leanings, they approached Mike's Amazing Cakes of Redmond, Washington with a simple request. "Make us a cake fit for a prince!" they said. By which of course, they meant The Prince of the Cosmos. Delivering on the inherent promise of their name, the team at Mike's Amazing Cakes crafted this spot-on replica of a Katamari ball for the couple's wedding. Feel free to find that thing totally awesome. It is. The Katamari cake however, is not the subject of today's tale. Instead, I'm here to show you the cake that Mike's crafted for this same couple's three-year anniversary. See that image embedded above? That's not plastic. It's not resin. It's not some kind of foam mock-up hanging in Valve's offices, either. That's a cake constructed almost entirely of traditional cake materials that looks exactly like the Space Core from Portal 2. Don't believe me? 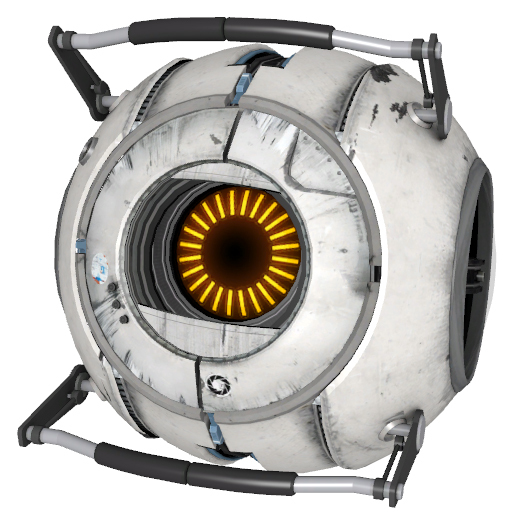 Here's a shot of the Core as it appears in Portal 2. Are you convinced yet? To prove that this thing isn't just a clever prop -- you can't trust anything you see on the 'net -- the couple's Flickr stream also includes an image of the Core being sliced up for serving. Notice the awesome silver gloves there? Yeah, that has no real relevance, but I like those too. Admittedly, none of this is world-changing news. In sum it's essentially advertisement for the impressive cakesmithing going on in Redmond. That said, any of you who don't find this entire situation incredibly cool and romantic should check to see when exactly your sense of whimsy burst into flames.